Bario is the unofficial capital of the Kelabit Highlands. Bario (population 900) is isolated from the rest of the world and you can only reach it by plane. 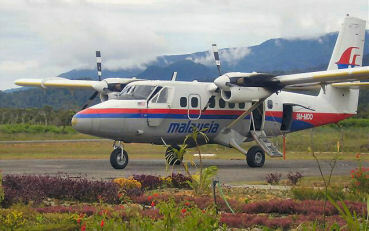 It takes one hour by air from Miri on a MAS Twin Otter 19-seater aircraft. Despite its geographical barrier, there are many infrastructures such as an airport, internet access and computer services, police station, two schools, churches, clinic, shops and various offices manned by skeletal staff. The children recently started playing computer games and doing their English lessons on PCs. The Kelabit Highlands are on a picturesque flat plateau in the north-eastern corner of Sarawak. It is 1,000m to 1,100m above sea level. All roads on the plateau lead to Bario. The Kelabit Highlands is the homeland of the Kelabit. This is one of the smallest ethnic groups in Sarawak. Like other inland groups, the Orang Ulu all live in longhouses, although they may vary slightly in design from group to group. "Orang Ulu" is a collective term meaning "people of the interior". It is used to describe a number of inland peoples including the Kelabit. Approximately there are still 5000 people, but there are about 1800 people living in 355 families at the Highlands. The others have moved elsewhere in Malaysia; younger people have left for large cities to further their studies, while others married outside their community and never returned. Many have landed well-paid jobs overseas and have settled there. The Kelabit have their own language, although most of them have learned to speak English or Malay. However, its remoteness has been no barrier to locals, some of whom have become academic high achievers. The Kelabit have one of the highest ratio of professionals. Among them arean Associate Professor, medical specialists, lawyers, engineers and corporate high flyers who have travelled widely. The Kelabit live in the highlands at the head of the Baram River, until recently a very inaccessible area. The Kelabit are also notable for being very tall and large of build, and they built many megalithic (large stone) monuments. Over a century ago, the Kelabits were involved in head hunting raids, not so much for ritual purposes but as a means to prove one�s courage, bravery, guts or valency, and to get even with their enemy. However, things have changed. Today among other things, the Kelabits are well-known for the friendliness and hospitality. The Bario Highlands were first visited by Australian Christian missionaries many decades ago. Trekking through the Kelabit Highlands from village to longhouse to village is a great way to experience the rainforest up close and personal. The two main departure points for treks are Barioand Ba'Kelalan. Resthouses offer simple accommodation at both villages, and local guides take tourists on overnight treks that involve jungle shelters and longhouse visits. Experienced mountaineers can also attempt Mount Murud and Batu Lawi. On the jungle trails that connect longhouse settlements around Bario, everyone you meet on foot will stop to at least say hello. Often, questions are exchanged in greeting. In their former world, this was both a courtesy as well as a way to gather news from visitors, to satisfy their curiosity about the world beyond their own. Gem's lodge is very nice and lies in an idyllic setting in the forest. 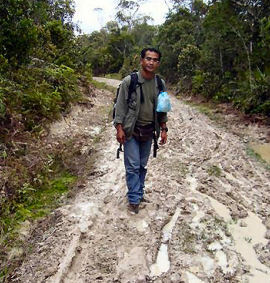 It's is about 6km out of Bario, near Pa'Umor. It would take about an hour to walk or a quick ride from the airport. 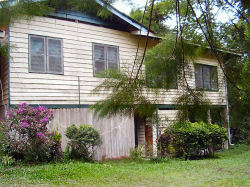 Gem�s Lodge is owned by Jaman and his wife Sumi, both Kelabit tribe members and natives of Bario. Jaman is an cheerful, friendly guy who takes great pleasure in hosting people at his large, comfortable, well-equipped lodge. When he isn�t maintaining the lodge, he guides groups on jungle treks for as little as two hours and as long as six days. Sumi spends her days cooking, cleaning, gardening and weaving souvenir can-holders for the guests from bandanus leaves that she collects from the surrounding jungle. Beside taht, Sumi raises three kid. Sumi never sits still, rarely stops smiling and sings all day long. This is exactly the remote, quiet, totally beguiling place where one could imagine getting comfortable and never leaving. The community's main economic activity is agriculture, mainly growing Bario rice. Bario is famous for its fragrant rice, which enjoys a price premium compared to other rice varieties from around the country and is regarded as Malaysia�s best-quality rice. The Kelabit are known for their generations-old form of rice farming, but the tribe also cultivates a variety of other crops well-suited to the cool climate of at the average 20 oC in the highlands. Besides rice the residents cultivate citrus fruits. Bario is famous for its sweet, refreshing, juicy Bario pineapple. The forest is still an important source of food. It is also the only way to get fresh meat in the highlands.